Eczema is a chronic inflammatory skin condition that can affect people of all ages, but especially young children and infants. Eczema comes in many forms and most of these forms tend to cause red itchy skin rashes. Persistent flare-ups of eczema can cause the skin to become thickened and scaly, and sometimes blister-like bumps can appear which ooze fluid and become crusty scabs. Atopic dermatitis is the most common type of eczema and it can affect any area of the body. It is common to have itchy patches of eczema on your hands, feet, upper chest, around the neck and facial area, and even on the scalp. It can be especially sore and irritating when it occurs inside the bend of the elbows and knees as the skin there constantly moves and stretches. Infant eczema can affect the face and scalp. The itching sensation on the inflamed skin can lead to intense scratching which can damage the skin even more and cause bacterial skin infections. If you suffer from this uncomfortable skin condition, there are many natural cures to get rid of eczema quicker. In this article I am going to cover 13 home remedies for eczema backed by research. These home remedies can help you find relief from its symptoms like dry skin, itchiness, and red rashes. I am also going to look at the reasons why some people experience eczema and what causes the breakout of itchy red rashes. This information can help you to know how to prevent eczema flare-ups and cope with its symptoms. You will also find helpful natural remedies to treat atopic dermatitis. Itchiness ranging from a mild tickle to a severe and intense itch is a symptom of nearly all types of eczema. In fact, the skin can become itchy before the appearance of any rash. Eczema is also a common reason for itchy bumps on your elbows. Respected dermatologist Dr. Debra Jaliman says that dry skin is usually associated with eczema. The affected skin often develops a rash and become thickened or scaly.1 These patches of reddened skin can turn a brownish-gray color and the skin can feel like leather. The symptoms of eczema can be aggravated if a person scratches the itchy rash because this allows Staphylococcus aureus bacteria to infect broken skin. The end result is that the skin becomes raw, swollen and very sensitive. It may also ooze fluid which can leave the skin with crusty patches when the fluid dries. Babies under 6 months. Red patches of “weepy” skin around your baby’s face and on the scalp. Babies from 6 to 12 months. Patches of eczema develop around the elbows and knees. If these patches become infected, then “pus bumps” can occur which turn crusty when the pus dries. Toddlers from 2 to 5 years. Your toddler’s eczema thickens and have the appearance of dry, scaly, and inflamed skin. Outbreaks of eczema may be more common around the mouth and eyelids. Other causes of eczema could be dry skin, a problem with your skin’s barrier protection, or environmental conditions. Eczema often runs in families. Natural remedies are an excellent way to treat eczema and to prevent itching by keeping your skin moist and moisturized. This type of treatment method for inflamed skin helps to reduce the temptation to scratch the skin and stops the skin from becoming dry and scaly. Let’s look at some of the best home remedies that are backed by research for treating the symptoms of eczema. Many eczema sufferers claim that organic unrefined virgin coconut oil helps to keep their outbreaks of eczema under control and gives them better results than much more expensive products. To use coconut oil to repair skin damaged by eczema all you have to do is apply coconut oil directly to the affected area several times a day and before you go to sleep. Apply the coconut oil daily until the reddish itchy patches of skin have gone completely. Coconut oil is more than just a way to get relief from dry, flaky skin. 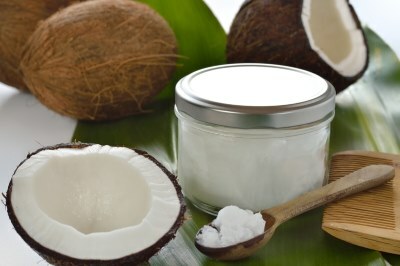 If you want to find out more of the health benefits that coconut oil can give you, please read my article about the amazing health benefits of coconut oil, and 60 uses for coconut oil. Raw unprocessed apple cider vinegar can reduce the inflammation and relieve the itching caused by eczema. Apple cider vinegar contains high amounts of acetic acid which can help kill off bacterial skin infections and reduce itchiness. Skin affected by atopic eczema usually has a higher pH level than healthy skin and this is one reason for the itching and inflammation.4 The acid content in apple cider vinegar helps to lower the skin’s pH level, thus helping to reduce the urge to scratch itchy red patches of skin. There are several ways in which you can use ACV to naturally relieve the symptoms of eczema. Use the apple cider vinegar home remedy for eczema method by mixing equal amounts of raw unprocessed ACV and water. Using a cotton ball or a spray bottle, apply the ACV remedy directly to the area of skin affected by eczema. Repeat the ACV treatment twice a day – once in the morning and once in the night before going to bed to speed up the healing process of itchy, inflamed skin. If you have sensitive skin, dilute the ACV more. Always remember to moisturize your skin after using the ACV eczema treatment. You can use coconut oil or jojoba oil. Jojoba oil is actually a liquid wax. It penetrates the skin deeply and is incredibly rich and moisturizing. The second natural treatment for eczema is to add 2 cups of ACV to warm or tepid bath water. Soak in this bath for at least 30 minutes. Repeat this treatment for at least 3 times a week to soothe irritated skin. The acidic content of the ACV will help to relieve itching all over your body. The third method is to take 1-2 tablespoons of ACV and mix it into a cup of water (you can add honey for a better taste). Drink once or twice every day to help get rid of the signs of eczema and prevent further flare-ups. You will also enjoy the many other health benefits of apple cider vinegar and honey. Chamomile contains soothing properties for any type of inflamed skin and is an excellent therapeutic agent for getting rid of eczema faster. Chamomile is an excellent home remedy for eczema because it contains anti-inflammatory and antibacterial compounds to help soothe infected red patches of skin. There are many ways to use chamomile to soothe all types of eczema (including atopic dermatitis), minor burns and sunburn. You can simply make a cup of soothing chamomile tea and use the chamomile tea bag to soothe itchy skin. Drinking the refreshing tea will help you to relax and will help take your mind off your skin irritation. You can make an anti-inflammatory chamomile ointment to soothe the itchy skin and kill off bacterial infections on cracked, dry skin. You should add 2-3 drops of chamomile oil to a tablespoon of virgin coconut oil and gently massage into the scaly, red skin. Apply the natural ointment 2-3 times a day every day to speed up healing and prevent bacterial infection. Chamomile oil is just one of the home remedies that I discuss in the article about the best essential oils for eczema. There you can find how to make a soothing eczema skin salve, a calming lavender spray, and how to use essential oils in the bath for eczema relief. Chamomile is a common herb to treat various ailments. You can find more useful information about chamomile and other herbs in my e-book the Herbal Remedies Guide. This guide will teach you how to treat common ailments using herbs. The main benefit of witch hazel for helping to cure the symptoms of eczema is its astringent and anti-inflammatory properties. This makes witch hazel a helpful home remedy to treat acne, cuts, psoriasis and eczema. Witch hazel is also one of the best natural remedies to get rid of skin rashes. Use witch hazel directly on your affected skin to help dry out weeping sores of severe eczema. Soak a cotton ball in witch hazel and gently apply to areas of skin where you have eczema. Repeat as necessary every day to get relief from eczema symptoms. Witch hazel is also a natural remedy for insect bites, sunburn, puffy eyes and itchy skin. You can find more information in my article about the top uses of witch hazel for great health. To help get fast relief from flaky, dry, itchy skin caused by eczema, you can use the healing properties of oatmeal. Take 2 cups of ground oatmeal and put them into an old pair of clean pantyhose and tie loosely. Draw a bath with warm water making sure that the oatmeal sock is under the faucet and the water flows through it. Squeeze the sock occasionally to get more of the oat liquid out. Soak in the tub for 15 minutes. During this time dab the oat sock onto patches of skin where you have eczema to soothe the inflammation itching. Take the oatmeal bath before going to bed at night to help you sleep better because very often the itchiness caused by eczema is worse during the night. 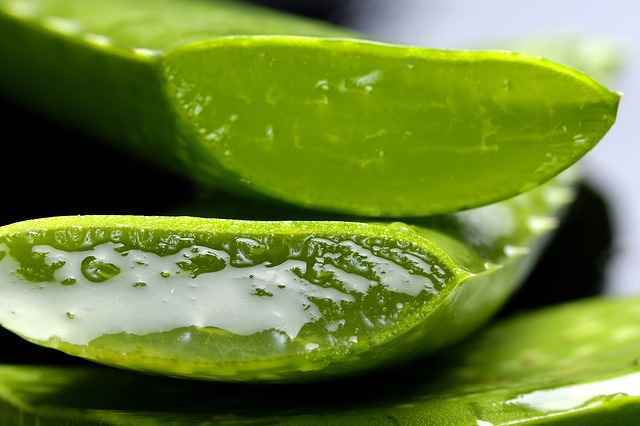 Aloe vera is a great home remedy to help relieve the painful symptoms of eczema and repair damaged skin. Aloe vera is well-known for having healing properties that help treat burned and itchy skin. This is because it contains anti-inflammatory properties and vitamins which nourish and protect the skin. The antibacterial activities of aloe vera also help to reduce or completely eliminate bacterial skin infections. To quickly relieve itching and scaly skin caused by eczema and at the same time nourish your damaged skin, apply pure aloe vera gel to the affected area. Gently massage the aloe vera gel 2-3 times a day every day until your itchy eczema rash is cured. Aloe vera is also a natural cure for psoriasis which is mentioned in my article about the best natural ways to naturally relieve psoriasis. 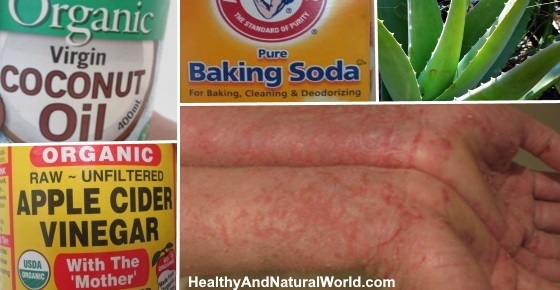 Baking soda (sodium bicarbonate) is an easy and cheap atopic dermatitis treatment. Baking soda contains anti-inflammatory properties that can help to relieve skin conditions that are characterized by dry, scaly, itchy patches of skin. Prepare a baking soda bath by adding half a cup of baking soda to a full warm bath. Soak for 20 minutes to relieve the itchy symptoms of eczema. After the bath, don’t forget to apply a mild moisturizer on the affected area. You can also use baking soda in a paste form if you have small patches of eczema on your hands, arms, face, or behind your elbows or knees. To make natural baking soda remedy for eczema, take one or two tablespoons of baking soda and add enough water to form a thick paste. Apply the remedy to the affected area to relieve itching fast. Leave for few minutes, then rinse off with warm water and apply moisturizer. Further reading: read my previous article about 9 uses for baking soda as a kitchen medicine. Licorice is known to help skin conditions like eczema and psoriasis because of its ability to soothe inflamed skin. Licorice cream can be bought at many online stores. Turmeric has numerous therapeutic health benefits to relieve many inflammatory conditions, including eczema. The active ingredient of turmeric that has anti-inflammatory properties is curcumin which gives it the bright yellow color and distinct taste. There are many ways to incorporate more turmeric into your daily diet. However, to help treat eczema using curcumin, it is best to regularly take curcumin supplements. Because curcumin is poorly absorbed into the body, look for supplements with piperine included. You can also use my recipe for making a natural turmeric face mask if you have eczema or psoriasis on your face. Evening primrose oil can also be taken as a supplement or applied topically as an effective natural treatment for eczema. Oil extracts from evening primrose contain essential fatty acids that have a beneficial effect on the skin. Although some reports say that evening primrose doesn’t help with eczema symptoms, many people have found it to be effective in completely relieving their itchy skin. You can make a topical application to nourish dry and flaky skin by adding a few drops of chamomile oil to a tablespoon of evening primrose oil. Apply the remedy to the affected area 2-3 times a day to get relief from red, itchy skin caused by eczema. You may find that taking evening primrose oil as a supplement could help alleviate the irritation caused by eczema. Although urea cream is not entirely natural, it is extremely effective for curing and preventing outbreaks of eczema. It is a very effective method of soothing irritated, itchy skin and it’s very cheap as well. Of course, urea is a natural ingredient, but the cream containing urea contains some other ingredients that are not natural, but since it is so effective in treating eczema I decided to include it in this article. Urea cream is a very effective way to quickly moisturize dry, cracked and thickened skin. It can also help to get rid of dead skin cells and remove scaly skin. You can buy urea cream on drugstores or online. For eczema relief, follow the instructions on the urea cream. Certain supplements have also shown to be effective in treating the symptoms of eczema. Some of these other ways to naturally get rid of eczema may work for you. GLA supplements have been shown to be very beneficial in treating eczema. Therefore the solution might be to take GLA as a supplement. It is recommended to use the GLA supplement for at least 4 weeks. Then symptoms should improve gradually. Our gut needs a proper balance of “good” bacteria for proper digestive system function. If the digestion system doesn’t work properly, our body is more sensitive to allergies and skin irritations. Further reading: You can read more about probiotics in my article 9 reasons to take probiotics and why it’s so good for you. Eczema is a chronic skin condition which can only be cured until the next flare-up. Therefore, one of the best ways in managing outbreaks of eczema is to take steps to prevent the frequency of eczema flare-ups. Moisturize your skin regularly throughout the day to keep a protective barrier on your skin and prevent itchiness. Try to avoid sudden changes in temperature. Stress can trigger an eczema flare-up, so try to find ways to manage stress better. Avoid clothing and other fabrics that can irritate sensitive areas of skin that are prone to eczema flare-ups. Avoid soaps and detergents that strip the skin of its protective oils. Dr. Jaliman also said that certain foods can trigger an outbreak. It’s important to keep a food diary to try to identify any foods that aggravate your eczema symptoms and then eliminate them from your diet. You may also want to try the raw food diet as it was used to successfully get rid of eczema. According to Dr. Tim Kenny on Patient.info, some of the most common trigger foods that make your eczema worse are cow’s milk, eggs, soy, wheat, peanuts, cheese, fish, chocolate, artificial food colors and tomatoes. It might seem a long process if you go through every food, but the fact is that most people eat certain foods all the time. Start with those foods that you eat on a regular basis and by a process of elimination, try to find out which food triggers your itchy breakouts. Eczema vs Psoriasis – What’s the Difference? Both eczema and psoriasis are chronic skin diseases that are difficult to manage and cause great discomfort. Both skin conditions show symptoms of itchy patches of dry skin and thickened skin that is inflamed. Both are connected to the immune system and are triggered by similar conditions. But psoriasis doesn’t affect as many people as eczema and it usually starts showing symptoms after the age of 16. The patches of skin are usually much thicker with psoriasis and are covered with silvery scales. The good news is that there are many natural home remedies to successfully treat psoriasis and eczema. So give them a try and see what works best for you. hi .. l have 3 types of Eczemas….yup..my skin is very sensitive & my immune system is overeactive so, l have asthma too. For my Seborrhoeic dermatitis i.e dandruff-like scalp due to a fungus, l used Nizoral shampoo with anti-fungal & vitaminB5 but, it’ll come back so, l used Henna paste i.e anti-fungal too coz l grow henna tree..It works! For my atopic dermatitis=l have combination dry-oily skin on certain part of my body so, l’m still trying to control it by growing chamomile ( died recently..sighs 🙁 ) but, my marigold is growing. Those are 2 wonderful herbs for most skin problems & soothing too. oh yes.. to calm irritation & redness you need anti-inflammatories like curcumin in turmeric ( antiseptic too, eczemas do bleed if scratched ), anthocyanin in dark, blue & purple veggies & fruits like red-purple & blue grapes ( concord is best so, l’m growing grapes ), all berries ( blueberry is best, chokeberry too ),blue corn, butterfly peas flowers ( l grow one ), purple asparagus, red big onions ( deep purple actually & l’m growing them too ), purple artichokes, eggplants etc. Google it! Best of luck ya! hey Vida, eczema is a sensitive subject for me, for years my eczema was so bad i would often have bloody sores from scratching so much. my heath crazy mother convinced me to try alkalise my body. basically it focuses on ridding your body of acid, which comes from a range of foods and even city air. 4 months later i my eczema, allergies and even asthma haven’t really bothered me in over a month 🙂 i also lost a lot of weight which is a nice bonus. i reccomend highly that you look into it. ive been using this new product that puts hydrogen in the body and helps clear the acid faster than anything, you can check it out at http://www.pure.sevenpoint2.com. all the best! I got it bad, my skin is a wreck and I don’t know what to do anymore, I have tried everything. I suffered for years until I removed cow’s milk from my diet. Turns out I am allergic to the protein in cow’s milk. I gave up milk and my skin began to clear up in a few days. I’ve had clear skin for 3 years now. So happy to hear you are okay now! Try a food called Mila seed from genesis pure which has a lot of omega -3 , fibre , anti oxidant among others. We have help a lot of people with skin problems, diabetes, high blood pressure and sugar with this food alone. Have you tried Renew lotion? This worked for my son. It also comes in a body wash, hand wash and bath oil. Try castor oil. Massage it in to problem areas. Use saran wrap or shower cap. Leave in up to 8 hours. Wash out with head and shoulders shampoo. Hi Pavani, this is something that a doctor or dermatologist needs to see. It’s impossible to give advice over the internet, as there are many things it can be, and the description is too general. thanq for your suggestion jenny. im applying olive oil.now it seems better.those are going to reduce. im 31 yrs old.since teenage im having sking pblm.then i didnot taken any precautions.till now im suffering. i met many doctors,.but i did’t get proper treatment for my skin type. I am a 57 year old female. I go out in the sun and get the little itchy fluid filled blisters or bumps. I’ve been getting this for about 25 years now. I was on a tropical cruise and it happened again. I went to their doctor and he said it was sun eczema. Do you or anyone else know what I can do for this? Hi Veronica, you can find homemade facial cleansers for dry skin here – https://www.healthyandnaturalworld.com/top-homemade-facial-cleansers/. You can get more tips in Wikihow website – http://www.wikihow.com/Treat-Dry-Skin-Naturally. You can also use olive oil cleanser which works as a natural cleanser and moisturizer. Just rub the oil into your skin and drape a warm, damp cloth over your face until it cools. then wipe away the excess oil. Try Immune First, mushroom beta glucan, it helped my son’s skin allergy. The polysaccharide derived from the mushrooms known as beta glucan is thought to have a significant impact on priming the immune system. This is the 2nd place I’m leaving this recipe, so I hope it gets to everyone who is (like I was) desperate to find relief and willing to try natural remedies rather than using topical steroids to treat skin problems. Topical steroids will break your skin down if used too much or too long – I speak from experience: I have 2 large splits in my skin that was misdiagnosed by the medical profession; they told me it was just a varicose vein popping out when in fact it was the topical steroid (triamcinolone) that was breaking down my skin and caused it to split and scar. Wish I could sue them! Anyway, this has worked for me and my husband: 1/2 oz evening primrose oil, 1/2 oz avocado oil, 1/2 oz flaxseed oil, 1/2 oz hazelnut oil, 6 drops geranium, 4 drops elemi, 4 drops tea tree, 3 drops lemon, 2 drops ylang ylang, 2 drops benzoin resin. Note: Geranium oil can lower your blood sugar level, so use caution or omit it if you have hypoglycemia (low blood sugar). Apply to affected area as necessary. I sincerely hope this helps someone else out there who suffered with this condition. My son suffered from eczema when he was a baby. He even lost his baby hair because of it. I used to cry and hated myself (perfectionist mother syndrome) because I felt sorry for my baby. His skin was so raw and he suffered for months. I tried everything but the only thing that worked was Aveeno cream. I used to apply it all over his skin every hour. Thank God! It only took a matter of few days and he was perfect again! He is now 17yrs old and still uses Aveeno to make sure the eczema will not come back. UK patients can now get this on prescription. At the time, the range wasn’t widely available and my chemist had to make special orders for it. Now it’s available almost everywhere. This isn’t an advertisement. I’m just sharing my experience. I have eczema. I have tried many creams to relieve the pain. Foderma serum helped me immensely. It took several times to apply it until it worked. It did not get rid of the eczema but it relieved a lot of the symptoms pain and redness. I have eczema.. i feel sick of it… i feel like i have burnt skin all the time.. its painful, extremely swollen in hot temperatures… i use creams.. none work besides Nevea greasy lotion in Shea Butter.. i also have severe asthma.. few of my bronchioles dont work.. i also have some cures for it.. get Faracort daily 2 puff, in the morning and night.. also get Sulvatumol and use Montair original one from India. U can get rid of asthma in a month. I also faced this eczema disease from the last 40 years and more but from the past 6 years, I am getting enough relief. That time I felt so reckless and hopeless that I tried so many things to get rid of it like using cortisone cream, oil etc. At last, one of my friends told me about some material on pH balancing (or alkalizing) diets, drinking lots of water (moderate amounts regularly throughout the day) and engaging in twenty minutes of easy aerobic exercise (approved by your Doctor of course) for at least three months. So it is really necessary to commit yourself 100% to the diet and do some aerobic exercise to get the cure of eczema.